EDIT: Giveaway is officially over. Congratulations to Amy Tolley for submitting the randomly chosen 18th entry. I have some juicy news you may want to share with your diary instead of your best friend so she doesn't steal the opportunity away from you. 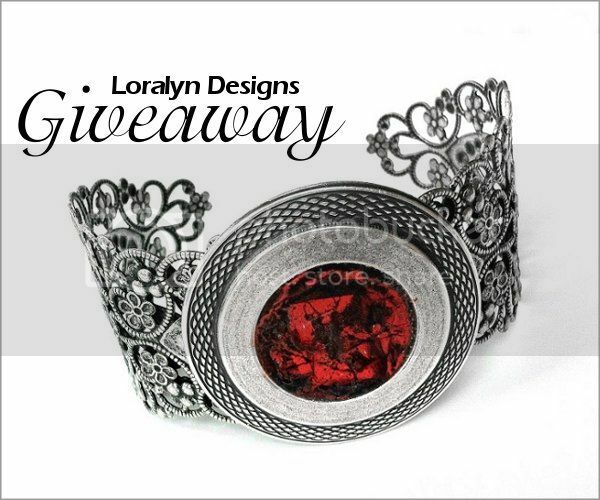 Laura of Loralyn Designs is giving away the captivating cuff above to one lucky winner. An intricate floral band is offset by a bold disc with an orange and black marbled center. The silver plated filigree bracelet combines both masculine and feminine elements to create a gothic design that looks amazing whether you're male or female, human or vampire. Laura has quite the experience in designing vampire style jewelry. Last October she designed a Celtic cross pendant that was chosen to appear during the fourth season of The Vampire Diaries on the CW. Her medieval necklace was worn by the ruggedly handsome vampire hunter, Galen Vaughn. If that accomplishment doesn't make you thirsty to check out more of her unique jewelry, I don't know what will! Use the Rafflecopter below to enter to win jewelry giveaway before 11:59pm EST on July 20, 2013. Be sure to leave the mandatory comment on the blog post with the same name you use to fill out the Rafflecopter - all entries by winner must be easily verified or a new winner will be chosen. Not including usernames when asked will also get you disqualified. http://www.etsy.com/listing/103648095/thin-black-cuff-bracelet-unisex-gothic?ref=shop_home_active this is just one item i love at her etsy shop thanks.. I love the Purple and sterling Silver Pendant. 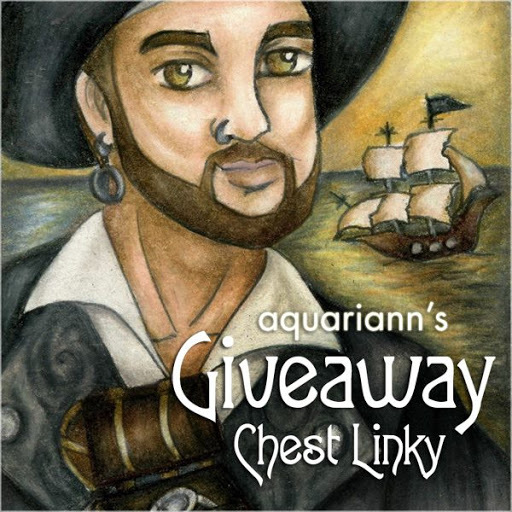 Thank you for a lovely giveaway! My favorite item is the Statement Ring Flower Silver Filigree Gothic Jewelry for Women. I love the Steampunk Teal Necklace! I love these...........http://www.etsy.com/listing/97421573/teal-earrings-silver-dangle-earrings?ref=shop_home_active....ciao4now64 at yahoo dot com. I love the Purple and Sterling Silver Pendant Necklace, Silver and Purple Jewelry, Lavendar Necklace, Silver Filigree Jewelry. the flower magnetic is so whimsical and creative. It's all beautiful but I love the Statement Ring Flower!! I like Modern Dark Silver Hammered Earrings. Purple and Sterling Silver Pendant Necklace - mon favourite. I love the Yellow and Silver Filgree Bracelet! I love the Purple and Hot Pink Heart Necklace! I love the Silver Oval and Blue Necklace. I like the Medieval Necklace Victorian. I love the purple and sterling silver necklace. Purple is my favorite color. I love the Simple Round Silver Industrial Necklace Purple and Aqua Blue Stainless Steel Jewelry. Thanks for the chance to win! I love the silver butterfly necklace. Thanks for the chance. I love the "Simple Round Silver Industrial Necklace Purple and Aqua Blue Stainless Steel Jewelry"
My favourite due to the mix of pink and purple colours in particular is the piece >>> https://www.etsy.com/au/listing/98356069/purple-and-hot-pink-heart-necklace?ref=shop_home_active It is absolutely exquisite imho. Have liked your shop, followed you on etsy, fb, twitter etc etc. LollipopDesignsAU / Lolly Smith on fb, LollipopAU on Twitter <3 <3 <3 your designs! I like the dark silver hammered earrings a lot! Christina - xristya@rock.com - I love the Celtic Knot Ring! I like the Modern Dark Silver Hammered Earrings, Triple Circle Silver Dangle Earrings, Two tone, Gunmetal Jewelry, Stainless Steel. I love the medieval necklace and cuff and the steampunk cuff. The giveaway item is gorgeous, too though! Love the deep red. My favorite is the Eternity Necklace, Silver Circle Necklace, Simple Round Silver Pendant, Dark Grey Jewelry, Stainless Steel Necklace. I like the Silver Butterfly Necklace. it is stunning, too bad there isnt a red one tho. I love your store ! http://www.etsy.com/listing/103648095/thin-black-cuff-bracelet-unisex-gothic?ref=shop_home_active <--This cuff is definitely my favorite, but I also love the green gear necklace. Stainless Steel Gear Pendant http://www.etsy.com/ru/listing/127153224/silver-gear-necklace-stainless-steel?ref=shop_home_active -this is my favorite one. I love the butterfly necklace. I actually love the cuff here, but her wine charms are nice as well. I like the Light Green and Silver Oval Pendant Necklace with Stainless Steel Chain, Wrapped Birds Nest Necklace. I love the Thin Black Cuff Bracelet, Unisex Gothic Jewelry, Rocker Bracelet, Customizable, Green Jewelry, Thin Cuff Bracelet, Emerald Green Bracelet. I like the statement ring flower. My favorite are the red heart earrings. I absolutely love the teal earrings! Yellow and Silver Filgree Bracelet, Victorian Gothic Jewelry, Multi Strand, Medieval Bracelet is my favorite. I absolutely love the cuff too though. Is this cuff only for men? As a lady, I would love love love to wear! I am addicted to cuff bracelets. The Purple and Hot Pink Heart Necklace, Silver Heart Pendant, Silver Jewelry Heart is so pretty! I love the Antique Silver and Teal Filigree Bracelet. Beautiful! I like: Red Heart Earrings. I like the Mens Ring Silver Filigree. I Love the Medieval naecklace! I like a lot of her jewelry. My favorite has to be the yellow and silver filigree flower necklace. So fun and flirty. my favorite item is the thin black cuff bracelets...i also love the silver and copper earrings. Pink Lapel pin. Love it! My favorite is the Teal and Black Cuff Bracelet with Stainless Steel Accent. I really like the Teal Heart Earrings. I love this one: http://www.etsy.com/listing/103648095/thin-black-cuff-bracelet-unisex-gothic?ref=shop_home_active. The brooches are really neat, too. I would love to win the Filigree Bracelet Cuff, the favourite on main display here for my fiance. I really like the Yellow and Silver Filgree Necklace, Flower Jewelry, Stylish Jewelry, Silver Flower Necklace, Yellow Necklace, Gift for Daughter. I LIKE THEM ALL--- would love the Filigree Bracelet Cuff---- they ALL are beautiful!! The cuff bracelet that's being given away. It's absolutely gorgeous! I really like the Purple and Sterling Silver Pendant Necklace. 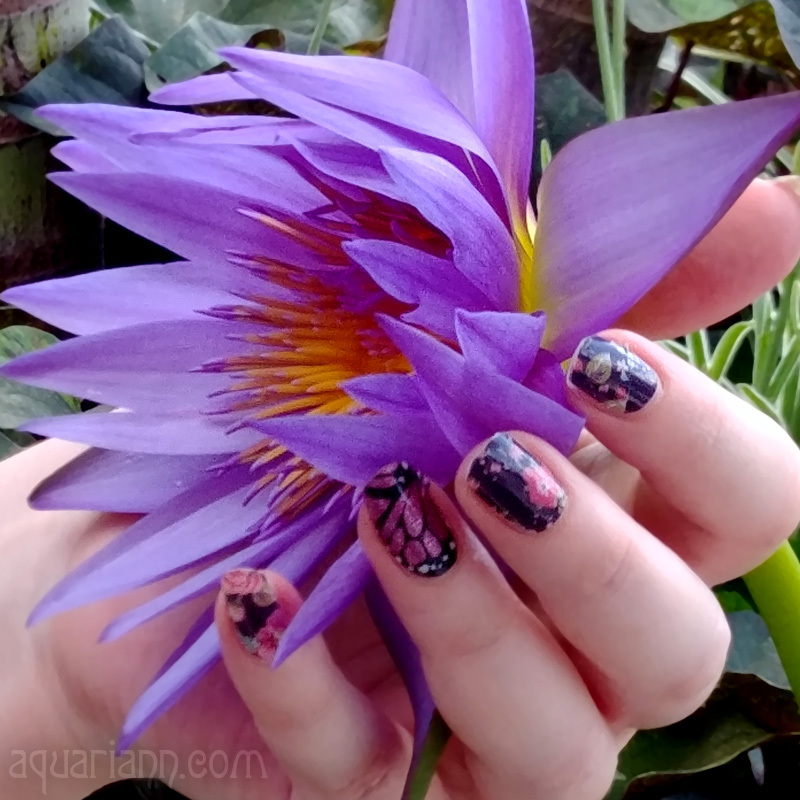 I love purple! I like the Teal and Black Cuff Bracelet with Stainless Steel Accent, Gothic Bracelet. I love the Pink Punk Fashion Earrings! My favorite piece is the Silver Butterfly Necklace.